Rublev Colours Bone Black is an opaque warm black with good tinting strength, fine grained and brushes 'long' in the direction of the brush stroke. Bone black, also known as bone char or animal charcoal, is a granular material produced by charring animal bones. The bones are heated to high temperatures without oxygen. It consists mainly of calcium phosphate and a smaller amount of carbon. Ivory black is an artists' pigment formerly made by grinding charred ivory. Ivory is no longer used because of the expense, and because animals that are natural sources of ivory are subject to international control as endangered species. Today, ivory black is considered a synonym for bone black. Among artist pigments, ivory black is considered a better grade of bone black, consisting of 15 percent or more of carbon. Natural Pigments uses only the best grade of bone char containing at least 18 percent carbon. 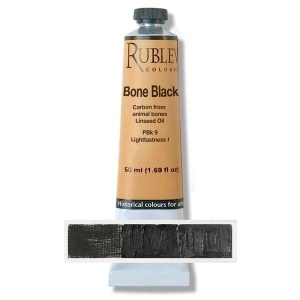 Rublev Colours bone char oil paint is named Bone Black because we use accurate names for products. Note: Colors swatches are shown in mass tone, straight from the tube, on the left, and mixed with an equal amount of white on the right. All pictures of color swatches in this web site are only approximations of the actual color of the oil paint. We have taken every care to match the color in these pictures on calibrated color monitors to the actual color. However, because of the wide variance in color monitors the results you get may vary.